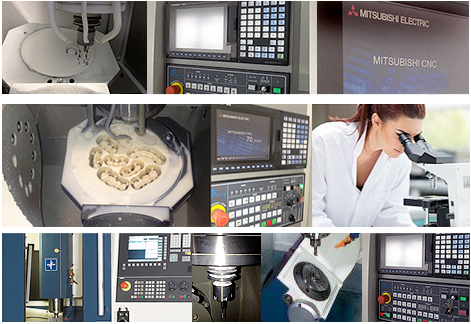 360 SDM milling center is a professional manufacturing center for individual CADCAM manufactured dental prosthetics. The production center was founded by the internationally renowned Dental CADCAM expert Dr. Amines Benalouane and Ron Tsai, CDT a pioneer in CADCAM Manufacturing. EZ-Mill 500 is a simultaneous Five-Axis CNC machine designed and built to address the needs of high volume labs. and production centers. The mill is fully integrated into the Dental Wings DWOS™ plat-form and has access to the most sophisticated milling strategies developed in Work NCTM kernel. EZ-Mill 500 is a high-productivity, high-precision machining center suitable for production of complex and challenging dental restorations. Its ability to both dry and wet mill broadens both the materials that are supported: Zirconia, Alumina, wax /PMMA, Cr-CO, Ti and glass ceramics and the indications it can address: Substructures, anatomies, implant custom abutments and implant bars. The recent development of intra-oral and impression scanners will require the development of reliable digital manufacturing process for manufacturing Dental Models. In partnership, with Dental-Wings and Sescoi, 360 SDM brings to the market the first genuine manufacturing process for producing Dental Models in an automated fashion in a cost effective manner. Finally, a true Four-Axis high-speed mill built with robust and high precision components. The EZ-Mill 400 is a general-purpose laboratory CNC machine suitable for demanding workflows in continuous production environment. The mill has both dry and wet milling capabilities, which broaden the dental restoration materials that are supported. Also, its automatic six-tool holder provides the flexibility for delivering optimized milling strategies for large selection of material choice. Thus resulting in higher quality of milled restorations, faster turn-around times and reduced waste of material. EZ-Mill 400’s unique integration within the Dental Wings DWOSTM solution takes the guesswork out of milling. The Dental Wings End-user can transition from the impression or model scan, to CAD Design, to generation of milling jobs, to initiation of the mill’s production. Each phase optimized through seamless software integration. EZ-Mill 400, an open architecture, fully integrated powerful workhorse that can accommodate all your needs. DWOS™ milling strategies are generated by CAM engine. Developed by Sescoi, a reputable French company with over 20 years of experience within the automotive and aerospace industries, Work NCTM is today, the most powerful and reliable CAM software in the dental market.